Think that daily dog walks are a given? According to a recent survey reported by rover.com, although 79% of dog parents think their dogs should be walked two times per day, 57% admit to skipping walks every week. What better way to start the year out right and get back into the habit of daily walks – or better yet, twice daily walks – than by celebrating Walk Your Pet Month! For humans, these walks are beneficial for nearly all the same reasons. In addition, taking a walk during the day helps stimulate melatonin and serotonin production. Plus, it’s a great stress reliever and gives you irreplaceable, uninterrupted time with your best friend. Using a harness rather than a collar is also advised. This is because over time, pulling can cause damage to the trachea. Harnesses also work well to even body weight and can be very helpful for dogs with mobility issues and sore joints. During the winter months, it is also important to protect your pet’s paws from frostbite and cracking. Booties are now widely available. If your dog is not a fan, consider a balm made for those precious pads. Musher’s Secret, Paw Soother by Natural Dog Company and Only Natural Pet Paw Balm are excellent choices. 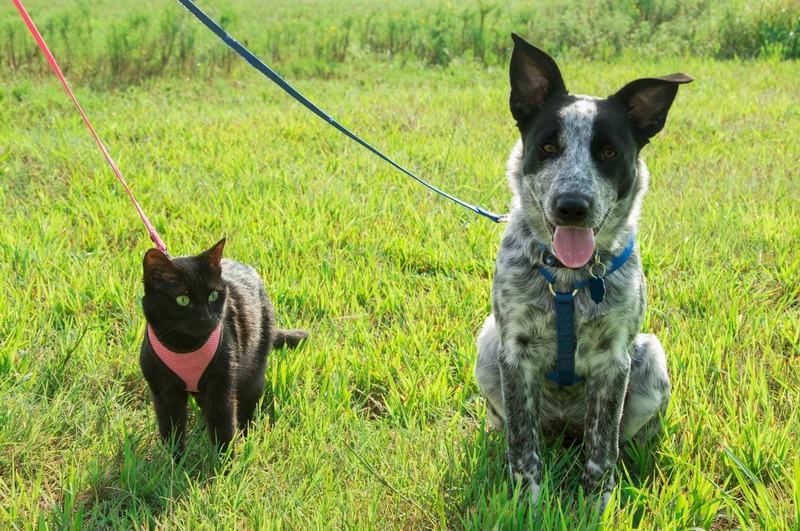 While it is commonplace for dogs to go on daily walks, cats are beginning to get in on the fun. Breeds like Bengals, Savannahs, as well as high energy kitties love to be walked. It gives them a chance to explore, mark their territory, expend energy and have interactive time with their human. According to cat behaviorist Jackson Galaxy, a.k.a., Cat Daddy, leash walking is also great because it provides an extra dose of exercise and they come home tired. Keep in mind that not all cats want to be walked. Cats who show no interest in the outside or may even be afraid to do so, should not be walked. However, if a cat seems to be fascinated looking out of the window or is curious every time the door is opened, he or she may be a perfect candidate. The cat should be in a secure harness, fastened to a leash. Training to get to this point can take a couple of weeks. Start by introducing the harness to your cat inside the house. Let the cat get used to the feel. Give a treat when putting the harness on. Some cats take to it quickly, some do not. Walking a cat is different than walking a dog. Cats may stop every few steps to sniff. They may pounce a bug. They may want to explore a bush. Be gentle when guiding your cat away from an unwanted space. To keep them calm or more relaxed during their walk, we suggest offering a Treatibles soft chew or single serve Ready Pack before heading out into the world.